How do complex coasters work? How do roller coasters work? The answer can be simple or complex, depending on the design of the roller coaster and the mechanisms that keep it operating safely and efficiently. 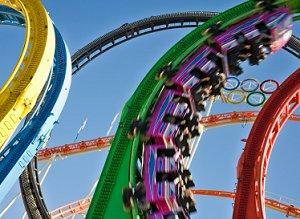 The most basic understanding of how a roller coaster works comes from the physics of roller coasters. Simply put, they "roll" and they "coast" according to the amount of energy the coaster train has and the type of track it has to complete. Yet while this is a simple explanation of how a coaster works, these complex machines have many complex features to ensure their safe, efficient, and thrilling operation. The first roller coasters were simple wheeled slides that worked based on gravity alone, but today's high tech coasters have several factors that determine how exactly they work. A roller coaster's track layout is carefully engineered to take advantage of the natural pull of gravity to allow the train to complete its course. Different ride elements such as banked curves, hills, loops, and twists are arranged in a precise order to compensate for dissipating energy as the coaster travels. This means that the highest elements and those requiring the most energy, such as the largest loops, are first in the track, and the smaller elements, such as helixes and curves, are typically last. The exact order, of course, depends on the type of roller coaster and the amount of energy it has to use during the course of the ride, but this basic principle applies to all roller coasters. Only once the ride's energy use is configured properly can the ride be designed for maximum disorientation, a compact style, and other crucial aesthetic factors. Gravity is the force that propels most roller coasters. To achieve the initial height necessary to let gravity take over the ride, classic coasters include a lift hill that may use a chain or steel cable to hoist the train to its maximum height. More modern, advanced coaster designs may use magnetic motors or a series of electromagnets to propel the cars forward and to get the initial speed necessary to complete the ride circuit. How a roller coaster stops is just as important as how it goes. Most roller coasters use fin brakes beneath the train's cars that use compressed air or similar devices that require force to stay open. This means that if the ride loses power or otherwise experiences a mechanical error, the brakes will automatically close and stop the ride safely. Older coasters use friction brakes, where a raised slide will contact the bottom of the train's cars and bring them to a stop. 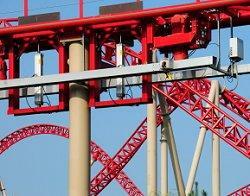 Very modern rides may even use magnetically controlled brakes. Computer Blocking: Sophisticated computer systems use photo sensors and cameras to track where each train is along a coaster's track. If a train does not pass critical checkpoints, the other trains are stopped still until it is safe to proceed. Mechanical Systems: Basic mechanical safety systems such as anti-rollback chain dogs and multi-directional wheels ensure that the coaster stays on the track and cannot travel backwards on the lift hill if the chain were to break or the coaster train were to slip off the catch. Passenger Restraints: Lap bars, shoulder harnesses, seat belts, and other restraints are used to keep riders securely in their seats during the ride's unexpected twists, dips, and turns. These restraints may be adjusted by ratcheting or snug hydraulic closures. A roller coaster cannot operate without its crew, the park employees who double check the ride's operation and provide assistance to riders. Many coasters have built in safety checks that the crew must complete before the ride will begin, such as needing to check all safety harnesses or manually release the ride brakes from different locations that ensure multiple employees are checking for proper operation. Depending on the size of a ride and the park's policy, one roller coaster may have a single operator or up to ten or more employees working at once. Roller coasters are thrilling rides for many reasons, and some of those reasons are psychological tricks built into a roller coaster design to make it seem even more exciting. The ride's colors, name, and theme add to its thrill factor. Park designers may plant trees close to the ride to simulate a higher speed, while tunnels can add feelings of claustrophobia and speed as well. Some rides will also skim near water with timed fountain eruptions or other effects to add a greater thrill. Understanding how do roller coasters work means more than just understanding the physics of roller coasters. A lot of factors, from track layout to safety features to thrill factor, are part of a successful roller coaster's design and they are what keep riders returning year after year for another ride.